Not to be confused with Bell Witch: The Movie. The Blair Witch Project is a 1999 American supernatural horror film written, directed and edited by Daniel Myrick and Eduardo Sánchez. It tells the fictional story of three student filmmakers—Heather Donahue, Michael C. Williams, and Joshua Leonard—who hike in the Black Hills near Burkittsville, Maryland in 1994 to film a documentary about a local legend known as the Blair Witch. The three disappeared, but their equipment and footage is discovered a year later. The purportedly "recovered footage" is the film the viewer sees. Myrick and Sánchez conceived of a fictional legend of the Blair Witch in 1993. They developed a 35-page screenplay with the dialogue to be improvised. A casting call advertisement in Backstage magazine was prepared by the directors and Donahue, Williams and Leonard were cast. The film entered production in October 1997, with the principal photography taking place in Maryland for eight days overseen by cinematographer Neal Fredericks. About 20 hours of footage was shot and was edited down to 82 minutes. When The Blair Witch Project premiered at the Sundance Film Festival on January 25, 1999, its promotional marketing campaign listed the actors as either "missing" or "deceased". Owing to its successful run at Sundance, Artisan Entertainment bought the film's distribution rights for $1.1 million. It had a North American release on July 14, 1999, before expanding to a wider release starting on July 30. While critical reception was mostly positive, audience reception was split. The film was widely regarded to have popularized the found-footage technique, later used by similarly successful thriller films such as Paranormal Activity, Cloverfield, and Chronicle. A sleeper hit, The Blair Witch Project grossed nearly $250 million worldwide on a modest budget of $60,000, making it one of the most successful independent films of all time. The film spawned two sequels—Book of Shadows and Blair Witch—released in October 2000 and September 2016, respectively. The Blair Witch franchise has expanded to include novels, video games, dossiers, comic books and additional merchandise. In October 1994, film students Heather, Mike and Josh set out to produce a documentary about the fabled Blair Witch. They travel to Burkittsville, Maryland, and interview residents about the legend. Locals tell them of Rustin Parr, a hermit who lived in the woods and kidnapped eight children in the 1940s, killing seven of them supposedly on the orders of the witch. After spending the night at a motel, the students explore the woods in north Burkittsville to research the legend. Along the way they meet two fishermen, one of whom warns them that the woods are haunted. He also tells them of a young girl named Robin Weaver, who went missing in 1888; when she returned three days later, she talked about "an old woman whose feet never touched the ground." His companion, however, is skeptical of the story. The students hike to Coffin Rock, where five men were found ritualistically murdered in the 19th century. Their bodies later disappeared. The group camps for the night. They move deeper into the woods the next day and locate what appears to be an old cemetery with seven small cairns and set up camp nearby. That night, they hear the sound of twigs snapping from all directions but assume the noises are from animals or locals. The following day, they try to hike back to the car but are unable to find it before dark and make camp. They again hear twigs snapping at night but fail to find the source of the noises. In the morning, they find that three cairns have been built around their tent during the night, which unnerves them. As they continue, Heather learns her map is missing. Mike later reveals he kicked it into a creek the previous day out of frustration, which prompts Heather and Josh to attack him in a rage. They realize they are now lost and decide simply to head south. They eventually reach a section where they discover a multitude of humanoid stick figures suspended from trees. They again hear sounds that night, including those of children laughing, among other strange noises. After an unknown force shakes the tent, they flee in panic and hide in the woods until dawn. Upon returning to their tent, they find that their possessions have been rifled through, and Josh's equipment is covered with slime. As they continue, they come across a log on a river identical to one they crossed earlier. They realize they have walked in a circle, despite thinking they traveled south all day, and once again make camp. Josh suffers a breakdown while holding the camera, taunting Heather for their circumstances and her constant recording of the events. Josh has disappeared the next morning, and Heather and Mike try in vain to find him before slowly moving on. That night, they hear Josh's agonized screams in the darkness but are unable to locate him. Mike and Heather theorize that Josh's screams are a fabrication by the witch to draw them out of their tent. The next day, outside her tent, Heather discovers a bundle of sticks tied with a piece of fabric from Josh's shirt. As she searches through it, she finds blood-soaked scraps of Josh's shirt as well as teeth, hair and what appears to be a piece of his tongue. Although distraught by the discovery, she chooses not to tell Mike. That night, Heather records herself apologizing to her family and to Mike's and Josh's families, taking full responsibility for their predicament. They again hear Josh's agonized cries for help and follow them to a derelict, abandoned house containing symbols and children's bloody hand-prints on the walls. Mike races upstairs to find Josh while Heather follows. Mike says he hears Josh in the basement. He runs downstairs while a hysterical Heather struggles to keep up. Upon reaching the basement, an unseen force attacks Mike, causing him to drop the camera and go silent. Heather enters the basement screaming, and her camera captures Mike facing a corner. Something unseen attacks Heather, causing her to drop her camera and go silent as well, and the footage ends. Development of The Blair Witch Project began in 1993. While film students at the University of Central Florida, Daniel Myrick and Eduardo Sánchez were inspired to make the film after realizing that they found documentaries on paranormal phenomena scarier than traditional horror films. The two decided to create a film that combined the styles of both. In order to produce the project, they, along with Gregg Hale, Robin Cowie and Michael Monello, started Haxan Films. The namesake for the production company is Benjamin Christensen's 1922 silent documentary horror film Häxan (English: Witchcraft Through the Ages). Myrick and Sánchez developed a 35-page screenplay for their fictional film, intending dialogue to be improvised. A casting call advertisement in Backstage magazine was prepared by the directors, and Donahue, Williams and Leonard were cast. The film entered production in October 1997. The principal photography took place in Maryland for eight days, overseen by cinematographer Neal Fredericks. About 20 hours of footage was shot; this was edited to 82 minutes. In developing the mythology behind the film, the creators used many inspirations. For instance, several character names are near-anagrams: Elly Kedward (The Blair Witch) is Edward Kelley, a 16th-century mystic, and Rustin Parr, the fictional 1940s child-murderer, began as an anagram for Rasputin. The Blair Witch is said to be, according to legend, the ghost of Elly Kedward, a woman banished from the Blair Township (latter-day Burkittsville) for witchcraft in 1785. The directors incorporated that part of the legend, along with allusions to the Salem witch trials and Arthur Miller's 1953 play The Crucible, to play on the themes of injustice done to those who were classified as witches. The directors also cited influences such as the television series In Search of..., and horror documentary films Chariots of the Gods and The Legend of Boggy Creek. Other influences included commercially successful horror films such as The Shining, Alien, and The Omen. Jaws was an influence, as the film hides the witch from the viewer for its entirety, increasing the suspense of the unknown. 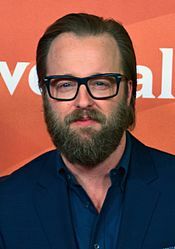 Joshua Leonard played a fictionalized version of himself in the film. Pre-production began on October 5, 1997. In talks with investors, the directors presented an eight-minute documentary, along with newspapers and news footage. The documentary was aired on the defunct television series Split Screen hosted by John Pierson. The directors advertised in Backstage magazine for actors with strong improvisational abilities. The informal improvisational audition process narrowed the pool of 2,000 actors. According to Heather Donahue, auditions for the film were held at Musical Theater Works in New York City. The advertisement said a "completely improvised feature film" would be shot in a "wooded location". Donahue said that during the audition, Myrick and Sánchez posed her the question: "You've served seven years of a nine year sentence. Why should we let you out on parole?" to which she had to respond. Joshua Leonard said he was cast due to his knowledge of how to run a camera, as no omniscient camera was used to film the scenes. Principal photography began on October 23, 1997 and lasted eight days. Most of the film was shot in Seneca Creek State Park in Montgomery County, Maryland. A few scenes were filmed in the historic town of Burkittsville. Some of the townspeople interviewed in the film were not actors, and some were planted actors, unknown to the main cast. Donahue had never operated a camera before and spent two days in a "crash course". Donahue said she modeled her character after a director she had once worked with, noting her character's "self-assuredness" when everything went as planned, and confusion during crisis. During filming, the actors were equipped with CP-16 film and Hi8 video cameras provided by cinematographer Neal Fredericks. They were given clues as to their next location through messages hidden inside 35 mm film cans left in milk crates they found with Global Positioning Satellite systems. They were given individual instructions to use to help improvise the action of the day. Teeth were obtained from a Maryland dentist for use as human remains in the film. Influenced by producer Gregg Hale's memories of his military training, in which "enemy soldiers" would hunt a trainee through wild terrain for three days, the directors moved the characters a long way during the day, harassing them by night, and depriving them of food. The final scenes were filmed at the historic Griggs House, a 200-year-old building located in the Patapsco Valley State Park near Granite, Maryland. Filming concluded on October 31, Halloween. After filming, the 20 hours of raw footage had to be cut down to two and a half hours; the editing process took more than eight months. The directors screened the first cut in small film festivals in order to get feedback and make changes that would ensure that it appealed to as large an audience as possible. Originally, it was hoped that the film would make it on to cable television, and the directors did not anticipate wide release. The final version was submitted to Sundance Film Festival. After becoming a surprise hit at Sundance, during its midnight premiere on January 25, 1999, Artisan Entertainment bought the distribution rights for $1.1 million. Prior to that, Artisan had wanted to change the film's original ending, as the test audience were puzzled, although scared. (Donahue screams in terror and finds Michael C. Williams facing a corner in the basement before she is knocked to the ground.) The directors and Williams traveled back to Maryland and shot four alternate endings, one of which employed gory elements. Ultimately, they decided to keep the original. Myrick said, "What makes us fearful is something that's out of the ordinary, unexplained. The first ending kept the audience off balance; it challenged our real world conventions and that's what really made it scary." In an interview with Entertainment Weekly, Sánchez revealed that when principal photography first wrapped, approximately $20,000 to $25,000 had been spent. Richard Corliss of Time magazine reported a $35,000 estimated budget. Other figures list a final budget ranging between $500,000 and $750,000. By September 2016, The Blair Witch Project has been officially budgeted at $60,000. The Blair Witch Project is thought to be the first widely released film marketed primarily by the Internet. The film's official website featured faux police reports as well as "newsreel-style" interviews. These augmented the film's found footage device to spark debates across the Internet over whether the film was a real-life documentary or a work of fiction. During screenings, the filmmakers made advertising efforts to promulgate the events in the film as factual, including the distribution of flyers at festivals such as Sundance, asking viewers to come forward with any information about the "missing" students. 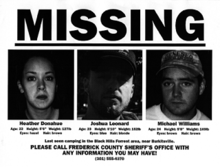 The campaign tactic was that viewers were being told, through missing persons posters, that the characters were missing while researching in the woods for the mythical Blair Witch. The IMDb page also listed the actors as "missing, presumed dead" in the first year of the film's availability. The film's website contains materials of actors posing as police and investigators giving testimony about their casework, and shared childhood photos of the actors to add a sense of realism. USA Today has opined that The Blair Witch Project was the first film to go viral despite having been produced before many of the technologies that facilitate such phenomena existed. The backstory for the film is a legend fabricated by Sánchez and Myrick which is detailed in the Curse of the Blair Witch, a mockumentary broadcast on the SciFi Channel in 1999 prior to the release of The Blair Witch Project. Sánchez and Myrick also maintain a website which adds further details to the legend. The legend describes the killings and disappearances of some of the residents of Blair, Maryland (a fictitious town on the site of Burkittsville, Maryland) from the 18th to 20th centuries. Residents blamed these occurrences on the ghost of Elly Kedward, a Blair resident accused of practicing witchcraft in 1785 and sentenced to death by exposure. The Curse of the Blair Witch presents the legend as real, complete with manufactured newspaper articles, newsreels, television news reports, and staged interviews. The Blair Witch Project premiered on January 25, 1999 at the Sundance Film Festival, and had a limited release on July 14 before going wide on July 30 after months of publicity, including a campaign by the studio to use the Internet and suggest that the film was "a record of real events". The distribution strategy for the film was created and implemented by Artisan studio executive Steven Rothenberg. The film earned $1,512,054 in its limited release opening weekend. The film went on to gross $29,207,381 from 1,101 locations and placed at number two in the United States box office third opening weekend, surpassing the science fiction horror film Deep Blue Sea which cleared $19,107,643 weekend gross. The film secured its second place in its fourth weekend, behind another horror film The Sixth Sense, which cleared $26,681,262. The film descended at number three in its fifth weekend, at number five in its sixth weekend, and number eight in its seventh and eighth weekends during Labor Day. The film dropped out of the top-ten list in its 10th weekend until its last screening in 107 theaters in its 17th weekend, grossing $28,866 and placing in number sixty-three. By the end of its theatrical run, the film grossed $140,539,099 in the US and Canada in its total screening and produced $108,100,000 in other territories, having an overall gross of $248,639,099 (over 4,000 times its original budget). The Blair Witch Project was the tenth highest-grossing film in the US in 1999, and has since earned the reputation of becoming a sleeper hit. Because the filming was done by the actors using hand-held cameras, much of the footage is shaky, especially the final sequence in which a character is running down a set of stairs with the camera. Some audience members experienced motion sickness and even vomited as a result. "At a time when digital techniques can show us almost anything, The Blair Witch Project is a reminder that what really scares us is the stuff we can't see. The noise in the dark is almost always scarier than what makes the noise in the dark." The Blair Witch Project drew positive reviews from critics. The review-aggregation website Rotten Tomatoes gives it a score of 87% based on 157 reviews from critics, and a weighted average of 7.67 out of 10. The website's "Critics Consensus" is, "Full of creepy campfire scares, mock-doc The Blair Witch Project keeps audiences in the dark about its titular villain – thus proving that imagination can be as scary as anything onscreen." Metacritic, another review aggregator, offers a weighted average score of 81 out of 100 based on 33 reviews, indicating "universal acclaim". Audience reception to the film, though, remains divided, with CinemaScore giving it an average grade of "C+" on a scale ranging from A+ to F based on audiences polled during opening weekend. The film's found footage technique received near-universal praise. Although this was not the first film to use it, the independent film was declared a milestone in film history due to its critical and box office success. Roger Ebert of the Chicago Sun-Times gave the film a total of four stars, and called it "an extraordinarily effective horror film". Peter Travers of Rolling Stone called it "a groundbreaker in fright that reinvents scary for the new millennium". Todd McCarthy of Variety said, "An intensely imaginative piece of conceptual filmmaking that also delivers the goods as a dread-drenched horror movie, The Blair Witch Project puts a clever modern twist on the universal fear of the dark and things that go bump in the night." Lisa Schwarzbaum of Entertainment Weekly gave a grade of "B", saying, "As a horror picture, the film may not be much more than a cheeky game, a novelty with the cool, blurry look of an avant-garde artifact. But as a manifestation of multimedia synergy, it's pretty spooky." Some critics were less enthusiastic. Andrew Sarris of The New York Observer deemed it "overrated," as well as a rendition of "the ultimate triumph of the Sundance scam: Make a heartless home movie, get enough critics to blurb in near unison 'scary,' and watch the suckers flock to be fleeced". A critic from The Christian Science Monitor said that while the film's concept and scares were innovative, he felt it could have just been shot "as a 30-minute short ... since its shaky camera work and fuzzy images get monotonous after a while, and there's not much room for character development within the very limited plot." R. L. Schaffer of IGN scored it two out of ten, and described it as "boring – really boring", and "a Z-grade, low-rent horror outing with no real scares into a genuine big-budget spectacle". The DVD for The Blair Witch Project was released on October 26, 1999 by Artisan, presented in a 1.33:1 windowboxed aspect ratio and Dolby Digital 2.0 audio. Special features include the documentary Curse of the Blair Witch, a five-minute Newly Discovered Footage, audio commentary, production notes, and cast and crew biographies. The audio commentary presents directors Daniel Myrick, Eduardo Sánchez, and producers Rob Cowie, Mike Monello and Gregg Hale, in which they discuss the film's production. The Curse of the Blair Witch feature provides an in-depth look inside the creation of the film. The film's Blu-ray version was released on October 5, 2010 by Lionsgate. Best Buy and Lionsgate had an exclusive release of the Blu-ray made available on August 29, 2010. The 20th Golden Raspberry Awards gave Heather Donahue its Worst Actress award, and nominated producers Robin Cowie and Gregg Hale for the Worst Picture award. At the Stinkers Bad Movie Awards, the film won the Biggest Disappointment category and received three nominations: Worst Picture (Cowie and Hale), Worst Actress (Donahue), and Worst Screen Debut (Heather, Michael, Josh, the Stick People and the world's longest running batteries). At the 1st Golden Trailer Awards, it received a nomination for Most Original Trailer and won two categories: Best Horror/Thriller and Best Voice Over. The Independent Spirit John Cassavetes Award awarded The Blair Witch Project its Best Film. For it's television premiere in October 2001 on the FX Channel, two deleted scenes were reinserted during the end credits of the film. An array of other films have relied on the found-footage concept and shown influence by The Blair Witch Project. These include Paranormal Activity (2007), REC (2007), Cloverfield (2008), The Last Exorcism (2010), Trollhunter (2010), Chronicle (2012), Project X (2012), V/H/S (2012), End of Watch (2012), and The Den (2013). Some critics have also noted that the film's basic plot premise and narrative style are strikingly similar to Cannibal Holocaust (1980) and The Last Broadcast (1998). Although Cannibal Holocaust director Ruggero Deodato has acknowledged the similarities of The Blair Witch Project to his film, he criticized the publicity that it received for being an original production; advertisements for The Blair Witch Project also promoted the idea that the footage is genuine. Despite initial reports that The Last Broadcast creators—Stefan Avalos and Lance Weiler—had alleged that The Blair Witch Project was a complete rip-off of their work and would sue Haxan Films for copyright infringement, they repudiated these allegations. One of the creators told IndieWire in 1999, "If somebody enjoys The Blair Witch Project there is a chance they will enjoy our film, and we hope they will check it out." Film critic Michael Dodd has argued that the film is an embodiment of horror "modernizing its ability to be all-encompassing in expressing the fears of American society". He noted that "In an age where anyone can film whatever they like, horror needn't be a cinematic expression of what terrifies the cinema-goer, it can simply be the medium through which terrors captured by the average American can be showcased". In 2008, The Blair Witch Project was ranked by Entertainment Weekly as number ninety-nine on their list of 100 Best Films from 1983 to 2008. In 2006, the Chicago Film Critics Association ranked it as number 12 on their list of Top 100 Scariest Movies. It was ranked number 50 on Filmcritic.com's list of 50 Best Movie Endings of All Time. In 2016, it was ranked by IGN as number 21 on their list of Top 25 Horror Movies of All Time, number 16 on Cosmopolitan's 25 Scariest Movies of All Time, and number three on The Hollywood Reporter's 10 Scariest Movies of All Time. In 2013, the film also made the top-ten list of The Hollywood Reporter's highest-grossing independent films of all time, ranking number six. Director Eli Roth has cited the film while promoting his own 2002 horror film Cabin Fever through the Internet. The Blair Witch Project was among the films included in the book 1001 Movies You Must See Before You Die. After the film was released, in late November 1999, the historic house where it was filmed was reportedly being overwhelmed by film fans who broke off chunks as souvenirs. The township ordered the house demolished the next month. In September 1999, D. A. Stern compiled The Blair Witch Project: A Dossier. Building on the film's "true story" angle, the dossier consisted of fabricated police reports, pictures, interviews, and newspaper articles presenting the film's premise as fact, as well as further elaboration on the Elly Kedward and Rustin Parr legends. (Another "dossier" was created for Blair Witch 2). Stern wrote the 2000 novel Blair Witch: The Secret Confessions of Rustin Parr. He revisited the franchise with the novel Blair Witch: Graveyard Shift, which features original characters and plot. A series of eight young adult books, entitled The Blair Witch Files, were released by Random subsidiary Bantam from 2000 to 2001. The books center on Cade Merill, a fictional cousin of Heather Donahue, who investigates phenomena related to the Blair Witch. She tries to learn what really happened to Heather, Mike, and Josh. In July 1999, Oni Press released a one-shot comic promoting the film, titled The Blair Witch Project #1. Written and illustrated by Cece Malvey, the comic was released in conjunction of the film. In October 2000, coinciding with the release of Book of Shadows: Blair Witch 2, Image Comics released a one-shot called Blair Witch: Dark Testaments, drawn by Charlie Adlard. In 2000, Gathering of Developers released a trilogy of computer games based on the film, which greatly expanded on the myths first suggested in the film. The graphics engine and characters were all derived from the producer's earlier game Nocturne. The first volume, Rustin Parr, received the most praise, ranging from moderate to positive, with critics commending its storyline, graphics and atmosphere; some reviewers even claimed that the game was scarier than the film. The following volumes, The Legend of Coffin Rock and The Elly Kedward Tale, were less well received, with PC Gamer saying that Volume 2's "only saving grace was its cheap price", and calling Volume 3 "amazingly mediocre". The Woods Movie (2015) is a feature-length documentary exploring the production of The Blair Witch Project. For this documentary, director Russ Gomm interviewed the original film's producer, Gregg Hale, and directors Eduardo Sánchez and Daniel Myrick. A sequel entitled Book of Shadows was released on October 27, 2000; it was poorly received by most critics. A third installment announced that same year did not materialize. On July 22, 2016, a surprise trailer for Blair Witch was revealed at the San Diego Comic-Con. The film was originally marketed as The Woods so as to be an exclusive surprise announcement for those in attendance at the convention. The film, distributed by Lionsgate, was slated for a September 16 release and stars James Allen McCune as the brother of the original film's Heather Donahue. Directed by Adam Wingard, Blair Witch is a direct sequel to The Blair Witch Project, and does not acknowledge the events of Book of Shadows: Blair Witch 2. However, Wingard has said that although his version does not reference any of the events that transpired in Book of Shadows, the film does not necessarily discredit the existence of Book of Shadows: Blair Witch 2. In September 2016, screenwriter Simon Barrett explained that in writing the new film, he only considered material that was produced with the involvement of the original film's creative team (directors Daniel Myrick and Eduardo Sánchez, producer Gregg Hale, and production designer Ben Rock) to be "canon", and that he did not take any material produced without their direct involvement—such as the first sequel Book of Shadows or The Blair Witch Files, a series of young adult novels—into consideration when writing the new sequel. In October 2017, co-director Eduardo Sánchez revealed that he and the rest of the film's creative team are developing a Blair Witch television series, though he clarified that any decisions would ultimately be up to Lionsgate now that they own the rights to it. In February 2018, it was announced that the series will be released on the studio's new subsidiary, Studio L, which specializes in digital releases. ^ "The Blair Witch Project". British Board of Film Classification. August 4, 1999. Archived from the original on February 11, 2017. Retrieved July 28, 2016. ^ a b c d e "The Blair Witch Project". Box Office Mojo. Archived from the original on April 24, 2013. Retrieved April 4, 2013. ^ a b c d e f Klein, Joshua (July 22, 1999). "Interview – The Blair Witch Project". The A.V. Club. Archived from the original on January 21, 2015. Retrieved January 26, 2015. ^ a b Kaufman, Anthony (July 14, 1999). "Season of the Witch". The Village Voice. Archived from the original on March 3, 2007. Retrieved September 26, 2006. ^ Rock, Ben (August 1, 2016). "The Making of The Blair Witch Project: Part 1 – Witch Pitch". Dread Central. Archived from the original on December 30, 2016. Retrieved March 19, 2017. ^ Aloi, Peg (July 11, 1999). "Blair Witch Project – an Interview with the Directors". The Witches' Voice. Archived from the original on May 25, 2006. Retrieved July 29, 2006. ^ a b c d "An Exclusive Interview with Dan Myrick, Director of The Blair Witch Project". House of Horrors. Archived from the original on March 3, 2016. Retrieved March 17, 2017. ^ a b Staff Writer (June 30, 1999). "Film Special: With Dan Myrick and Eduardo Sanchez". The Washington Post. Archived from the original on June 15, 2016. Retrieved March 17, 2017. ^ Rock, Ben (August 15, 2016). "The Making of The Blair Witch Project: Part 3 – Doom Woods Preppers". Dread Central. Archived from the original on March 28, 2017. Retrieved March 27, 2017. ^ a b Conroy, Tom (July 14, 1999). "The Do-It-Yourself Witch Hunt". Rolling Stone. Archived from the original on October 1, 2007. Retrieved August 2, 2006. ^ a b c d Staff (January 1, 1999). "Heather Donohue – Blair Witch Project". KAOS 2000 Magazine. Archived from the original on March 30, 2010. Retrieved July 30, 2006. ^ Loewenstein, Melinda (March 16, 2013). "How Joshua Leonard Fell In Love With Moviemaking". Backstage. Archived from the original on March 9, 2013. Retrieved October 31, 2015. ^ a b c Rock, Ben (August 22, 2016). "The Making of The Blair Witch Project Part 4: Charge of the Twig Brigade". Dread Central. Archived from the original on September 9, 2016. Retrieved March 19, 2017. ^ Lim, Dennis (July 14, 1999). "Heather Donahue Casts A Spell". The Village Voice. Archived from the original on December 4, 2007. Retrieved September 26, 2007. ^ a b c John Young (July 9, 2009). "'The Blair Witch Project' 10 years later: Catching up with the directors of the horror sensation". Entertainment Weekly. Archived from the original on August 23, 2009. Retrieved July 10, 2009. ^ a b Atwood, Liz (November 25, 1999). "House used in `Witch' due to be demolished". The Baltimore Sun. Archived from the original on March 16, 2017. Retrieved March 16, 2017. ^ Rock, Ben (August 29, 2016). "The Making of The Blair Witch Project: Part 5 – The Art of Haunting". Dread Central. Archived from the original on October 25, 2016. Retrieved March 19, 2017. ^ Rock, Ben (September 5, 2016). "The Making of The Blair Witch Project: Part 6 – Guerrilla Tactics". Dread Central. Archived from the original on September 9, 2016. Retrieved March 19, 2017. ^ a b c Kinane, Ruth (April 5, 2017). "The Blair Witch Project almost ended with a different terrifying fate". Entertainment Weekly. Archived from the original on June 3, 2017. Retrieved June 17, 2017. ^ Rock, Ben (September 12, 2016). "The Making of The Blair Witch Project: Part 7 – The Embiggening". Dread Central. Archived from the original on September 19, 2016. Retrieved March 19, 2017. ^ Corliss, Richard (January 15, 2009). "The Blair Witch Project". Time. Archived from the original on December 26, 2015. Retrieved February 10, 2017. ^ Fleming Jr., Mike (September 19, 2016). "Blair Witch Flop Scares Up Horrific Memories For Joe Berlinger". Deadline Hollywood. Archived from the original on February 17, 2017. Retrieved February 16, 2017. ^ Lodge, Guy (September 11, 2016). "Film Review: Blair Witch". Variety. Archived from the original on October 25, 2016. Retrieved February 16, 2017. ^ Weinraub, Bernard (August 17, 1999). "Blair Witch Proclaimed First Internet Movie". Chicago Tribune. Archived from the original on April 30, 2014. Retrieved January 27, 2012. ^ Weinraub, Bernard (October 30, 2015). "Was The Blair Witch Project The Last Great Horror Film?". BBC News. Archived from the original on October 30, 2015. Retrieved October 31, 2015. ^ "The 12 Ballsiest Movie Publicity Stunts". MTV. July 24, 2016. Archived from the original on January 10, 2017. Retrieved January 9, 2017. ^ Davidson, Neil (August 5, 2013). "The Blair Witch Project: The best viral marketing campaign of all time". MWP Digital Media. Archived from the original on January 30, 2017. Retrieved January 9, 2017. ^ Amelia River (July 11, 2014). "The Greatest Movie Viral Campaigns". Archived from the original on February 11, 2015. Retrieved July 7, 2016. ^ Hawkes, Rebecca (July 25, 2016). "Why did the world think The Blair Witch Project really happened?". The Daily Telegraph. Archived from the original on January 9, 2017. Retrieved January 9, 2017. ^ "The Blair Witch Project Official Website: The Aftermath". blairwitch.com. Archived from the original on October 29, 2016. ^ Bowies, Scott. "'Blair Witch Project': Still a legend 15 years later". USA Today. Archived from the original on March 8, 2016. Retrieved February 24, 2016. ^ a b "Curse of the Blair witch". Entertainment Weekly. October 29, 1999. Archived from the original on September 3, 2016. Retrieved August 4, 2016. ^ "The Blair Witch". blairwitch.com. Archived from the original on July 7, 2007. Retrieved August 4, 2016. ^ DiOrio, Carl (July 19, 2009). "Steve Rothenberg dies at age 50". The Hollywood Reporter. Archived from the original on February 1, 2010. Retrieved August 2, 2009. ^ McNary, Dave (July 20, 2009). "Lionsgate's Steven Rothenberg dies". Variety. Archived from the original on July 27, 2009. Retrieved August 2, 2009. ^ "The Blair Witch Project: July 30 – August 1, 1999 Weekend Box Office". Box Office Mojo. Archived from the original on September 2, 2016. Retrieved March 15, 2017. ^ "The Blair Witch Project: August 6–8, 1999 Weekend Box Office". Box Office Mojo. Archived from the original on March 18, 2016. Retrieved March 15, 2017. ^ "The Blair Witch Project: August 13–15, 1999 Weekend Box Office". Box Office Mojo. Archived from the original on April 3, 2016. Retrieved March 15, 2017. ^ "The Blair Witch Project: August 20–22, 1999 Weekend Box Office". Box Office Mojo. Archived from the original on September 14, 2015. Retrieved March 15, 2017. ^ "The Blair Witch Project: August 27–29, 1999 Weekend Box Office". Box Office Mojo. Archived from the original on September 10, 2015. Retrieved March 15, 2017. ^ "The Blair Witch Project: September 3–5, 1999 Weekend Box Office". Box Office Mojo. Archived from the original on October 23, 2015. Retrieved March 15, 2017. ^ "The Blair Witch Project: September 17–19, 1999 Weekend Box Office". Box Office Mojo. Archived from the original on October 11, 2015. Retrieved March 15, 2017. ^ "The Blair Witch Project: November 5–7, 1999 Weekend Box Office". Box Office Mojo. Archived from the original on October 23, 2015. Retrieved March 15, 2017. ^ "1999 Yearly Box Office Results". Box Office Mojo. Archived from the original on February 15, 2017. Retrieved February 11, 2017. ^ Kerswell, J.A. (2012). The Slasher Movie Book. Chicago, Ill.: Chicago Review Press. ISBN 1556520107. ^ Wax, Emily (July 30, 1999). "The Dizzy Spell of 'Blair Witch Project'". The Washington Post. Archived from the original on May 29, 2014. Retrieved March 1, 2012. ^ a b Ebert, Roger. "The Blair Witch Project Movie Review (1999)". Chicago Sun-Times. Archived from the original on November 10, 2016. Retrieved January 9, 2017. ^ Smolinski, Julieanne (February 7, 2012). "The Nostalgia Fact-Check: Does The Blair Witch Project Hold Up?". Vulture. Archived from the original on September 1, 2017. Retrieved January 26, 2018. ^ "The Blair Witch Project". Rotten Tomatoes. Fandango. Retrieved April 17, 2019. ^ "The Blair Witch Project". Metacritic. Archived from the original on October 14, 2010. Retrieved December 30, 2016. ^ Nordine, Michael (September 6, 2016). "The Blair Witch Project Honest Trailer: Revisit the Horror Classic Before Seeing Adam Wingard's Secret Sequel". IndieWire. Archived from the original on November 13, 2016. Retrieved June 17, 2017. ^ Singer, Matt (August 13, 2015). "25 Movies With Completely Baffling CinemaScores". ScreenCrush. Retrieved October 17, 2017. The film is located at page five of the article's image gallery. ^ a b Rawson-Jones, Ben (October 22, 2014). "The Blair Witch Project 15 years on: The horror movie that changed everything". Digital Spy. Archived from the original on March 16, 2017. Retrieved March 16, 2017. ^ a b Schaefer, Sandy (September 17, 2016). "Blair Witch and the Evolution of the Found-Footage Genre". Screen Rant. Archived from the original on February 26, 2017. Retrieved March 16, 2017. ^ a b c Trumbore, Dave (September 16, 2016). "The Blair Witch Project Effect: How Found Footage Shaped a Generation of Filmmaking". Collider. Complex. Archived from the original on October 22, 2016. Retrieved June 17, 2017. ^ Williams, Mary Elizabeth (June 13, 2014). "Horror's first viral hit: How The Blair Witch Project revolutionized movies". Salon. Archived from the original on January 16, 2015. Retrieved March 16, 2017. ^ Travers, Peter (July 30, 1999). "The Blair Witch Project". Rolling Stone. Archived from the original on January 10, 2017. Retrieved January 9, 2017. ^ McCarthy, Todd (January 26, 1999). "Review: The Blair Witch Project". Variety. Archived from the original on January 10, 2017. Retrieved January 9, 2017. ^ Schwarzbaum, Lisa (July 23, 1999). "The Blair Witch Project". Entertainment Weekly. Archived from the original on January 10, 2017. Retrieved January 9, 2017. ^ Sarris, Andrew (August 16, 1999). "Who's Afraid of The Blair Witch Project?". The New York Observer. Archived from the original on January 10, 2017. Retrieved January 9, 2017. ^ Staff (July 23, 1999). "The Worst DUD". The Christian Science Monitor. Archived from the original on January 10, 2017. Retrieved January 9, 2017. ^ Schaffer, R.L. (October 26, 2010). "The Blair Witch Project Blu-Ray Review". IGN. Archived from the original on January 10, 2017. Retrieved January 9, 2017. ^ Hunt, Bill (October 21, 1999). "DVD Review – The Blair Witch Project". The Digital Bits. Archived from the original on January 13, 2017. Retrieved January 11, 2017. ^ Beierle, Aaron (January 4, 2000). "The Blair Witch Project". DVD Talk. Archived from the original on August 17, 2014. Retrieved January 11, 2017. ^ "The Blair Witch Project Blu-ray". Blu-ray.com. Archived from the original on June 6, 2012. Retrieved May 29, 2012. ^ "The Blair Witch Project". High Def Digest. Archived from the original on March 29, 2016. Retrieved March 18, 2016. ^ Reid, Joe (January 23, 2013). "13 Great Movies Nominated for Razzie". MTV. Archived from the original on February 27, 2017. Retrieved February 27, 2017. ^ Meslow, Scott (September 16, 2016). "The Blair Witch Project's Heather Donahue Is Alive and Well". GQ. Archived from the original on October 29, 2016. Retrieved February 27, 2017. ^ "1999 22nd Hastings Bad Cinema Society Stinkers Awards". Los Angeles Times. Archived from the original on January 3, 2007. Retrieved July 8, 2013. ^ "Golden Trailer Awards: Nominees (1999)". Golden Trailer Awards. Archived from the original on November 4, 2016. Retrieved March 18, 2017. ^ Gordon, Naomi; Armitage, Hugh (September 12, 2016). "What happened to the the Blair Witch Project cast?". Digital Spy. Archived from the original on February 27, 2017. Retrieved February 27, 2017. ^ christhegeek517 (April 16, 2019). "The Blair Witch Project: Blu-ray Vs. FX Television Broadcast". Bootleg Comparisons. Retrieved April 17, 2019. ^ a b Barnett, David (September 15, 2016). "Blair Witch was a revelation, but found footage owes its roots to classic books". The Independent. Independent News & Media. Archived from the original on September 17, 2016. Retrieved June 17, 2017. ^ a b Crucchiola, Jordan (September 16, 2016). "Charting The Blair Witch Project's Influence Through 10 Horror Films That Followed". Vulture. Archived from the original on December 11, 2016. Retrieved June 17, 2017. ^ Gleiberman, Owen (March 3, 2012). "Project X and Chronicle prove that the found-footage way of making a movie can be applied to...anything. And that now it will be". Entertainment Weekly. Archived from the original on February 11, 2017. Retrieved February 11, 2017. ^ De Angelis, Michéle (Director) (June 22, 2003). In the Jungle: The Making of Cannibal Holocaust (Motion picture). Italy: Alan Young Pictures. ^ Hernandez, Eugene (August 9, 1999). "Editorial: Blair Witch v. Last Broadcast — Has It Really Come to This?". IndieWire. Archived from the original on August 5, 2017. Retrieved January 11, 2017. ^ "Safe Scares: How 9/11 caused the American Horror Remake Trend (Part One)". The Missing Slate. August 31, 2014. Archived from the original on October 11, 2014. ^ "The New Classics: Movies EW 1000: Movies – Movies – The EW 1000 – Entertainment Weekly". Entertainment Weekly. Archived from the original on August 7, 2009. ^ Soares, Andre. "Scariest Movies Ever Made: Chicago Critics' Top 100". Alt Film Guide. Archived from the original on June 4, 2015. Retrieved February 10, 2017. ^ Null, Christopher (January 1, 2006). "The Top 50 Movie Endings of All Time". Filmcritic.com. Archived from the original on August 20, 2006. Retrieved July 30, 2006. ^ "Top 25 Horror Movies of All Time". IGN. August 22, 2016. Archived from the original on February 20, 2017. Retrieved February 19, 2017. ^ McClure, Kelly (October 17, 2016). "The 25 Scariest Movies of All Time". Cosmopolitan. Archived from the original on February 20, 2017. Retrieved February 19, 2017. ^ Mintzer, Jordan (October 26, 2016). "Critic's Picks: 10 Scariest Movies of All Time". The Hollywood Reporter. Archived from the original on January 10, 2017. Retrieved January 9, 2017. ^ "Top 10: Indies at the Box Office". The Hollywood Reporter. June 3, 2013. Archived from the original on January 30, 2017. Retrieved March 16, 2017. ^ Schneider, Steven Jay, ed. (2015). 1001 Movies You Must See Before You Die. Quintessence Editions (9th ed.). Hauppauge, New York: Barron's Educational Series. p. 874. ISBN 978-0-7641-6790-4. OCLC 796279948. ^ a b Lesnick, Silas (September 16, 2016). "The Complete Blair Witch Legend". CraveOnline. Archived from the original on January 10, 2017. Retrieved January 9, 2017. ^ Merill, Cade (2000). "Cade Merill's The Blair Witch Files". Random House. Archived from the original on December 7, 2008. Retrieved September 8, 2009. ^ Kleinhenz, Marc N. (September 20, 2016). "A Complete Guide to the Blair Witch Mythology". Screen Rant. Archived from the original on February 26, 2017. Retrieved March 17, 2017. ^ Smith, Jeff (April 14, 2000). "Blair Witch Project Interview". IGN. Archived from the original on March 5, 2016. Retrieved January 10, 2017. ^ "Blair Witch Volume I: Rustin Parr". Metacritic. Archived from the original on August 14, 2016. Retrieved January 10, 2017. ^ "Blair Witch 2: The Legend of Coffin Rock". PC Gamer: 88. February 2001. ^ Williamson, Colin (April 2001). "Blair Witch Volume 3: The Elly Kedward Tale". PC Gamer: 90. Archived from the original on March 11, 2005. Retrieved March 10, 2014. ^ "Blair Witch Documentary Goes into The Woods Movie". Dread Central. January 1, 2006. Archived from the original on February 14, 2015. Retrieved July 28, 2006. ^ "Finally a Doc On 'The Blair Witch Project' – Trailer For "The Woods Movie"". Bloody Disgusting. January 1, 2006. Archived from the original on February 13, 2015. Retrieved July 28, 2006. ^ Hanley, Ken W. (January 19, 2015). "Book of Shadows: Blair Witch 2". Fangoria. Stream to Scream. Archived from the original on August 17, 2015. Retrieved July 15, 2015. ^ Singer, Matt (October 20, 2010). "Five Lessons We Hope "Paranornal Activity 2" Learned from "Blair Witch 2"". IFC. Archived from the original on July 17, 2015. Retrieved July 15, 2015. ^ "Blair Witch 3". Yahoo! Movies. January 1, 2006. Archived from the original on May 9, 2006. Retrieved July 28, 2006. ^ Bibbiani, William (July 23, 2016). "Comic-Con 2016 Review: The (Blair) Witch is Back!". CraveOnline. Archived from the original on January 12, 2017. Retrieved January 10, 2017. ^ Woerner, Meredith. "'Blair Witch' sequel surprises Comic-Con with a secret screening and trailer". The Los Angeles Times. Archived from the original on July 24, 2016. Retrieved July 23, 2016. ^ Collis, Clark. "Secret Blair Witch sequel gets new trailer, September release date". Entertainment Weekly. Archived from the original on July 24, 2016. Retrieved July 23, 2016. ^ a b Eisenberg, Eric (September 14, 2016). "Why The New Blair Witch Movie Ignores Book Of Shadows: Blair Witch 2". Cinemablend. Archived from the original on October 4, 2016. ^ "Eduardo Sanchez Hints at Blair Witch TV Series". Starburst. October 30, 2017. Archived from the original on January 26, 2018. Retrieved October 30, 2017. ^ "74 - Podcast of Horror II: The Blair Witch Project". Diminishing Returns. October 30, 2017. Retrieved October 30, 2017. ^ McNary, Dave (February 22, 2018). "Lionsgate Unveils 'Studio L' Digital Slate With 'Honor List,' 'Most Likely to Murder'". Variety. Archived from the original on February 22, 2018. Retrieved February 23, 2018. Wikimedia Commons has media related to The Blair Witch Project.